One Las Vegas is a High Rise Condo give off a quite community feel. 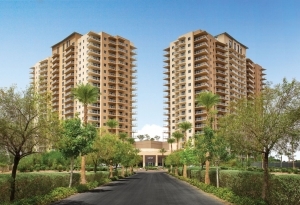 It is located on Las Vegas Blvd and the tower offers large livable floor plans for their residents. There are glass windows off every balcony that gives you a spectacular view of the entire city. There is a two story gym with a fitness center that is state of the art, including free weights, cardio equipment, Pilates Cadillac Reformer, yoga room and locker rooms with showers and saunas. Residence will also enjoy a pool featuring Martinique Daybeds, cabanas and large spa, Fire pit, BBQ grills and summer kitchens. Moving along, after a swim you can catch a movie in the movie theater with contemporary oversized recliners. You will never have to leave your home. Not even to eat, why; because you will be dining in your very own catering and serving kitchen. Also enjoy the tennis court, two dog parks, library, conference room with A/V connectivity and last but definitely not least, two private message rooms.